It’s been twenty years or so since my son Dylan said that. Something had ended up broken – probably due to “just messin’ around” – and restitution was owed. Usually, I’d cover what losses were incurred, but for whatever reason, this time I had told him that it was coming out of his money. He smugly replied that he had no money. “Easy fix.” I said “You have baseball cards. I guess we’ll have to sell one of those.” “The Barry Bonds” referred to the acrylic-encased prized rookie card. 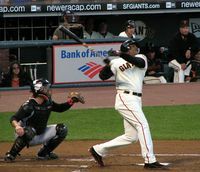 Bonds is now considered to be one of the greatest baseball players of all-time. He has a record-setting seven MVP awards. He is a 14-time All-Star and 8-time Gold Glove-winner. He holds numerous Major League Baseball records, including the all-time Major League Baseball home run record with 762 and the single-season Major League record for home runs with 73 (set in 2001), and is also the all-time career leader in both walks (2,558) and intentional walks (688). But that’s not what made him special. Not to Dylan. He was special because he was born on July 24th. That’s a big deal you see. It’s Dylan’s birthday. Also born on July 24th? Alexander Dumas, author of The Count of Monte Cristo, Dylan’s favorite book. Dylan was convinced from that point on that being born on a day that special was proof of the magnitude of his own destiny. He’s a grown man now… married to his college sweetheart, expecting a baby girl next month. He works in the industry that has always fascinated him – Finance. He restored a bargain-priced foreclosed house into a very comfortable home in the mountains. And he is, by all accounts, the “nicest, most even-tempered guy” anyone has ever met… at least that’s what people tell me. All because of that one special day. And what do we know about birthdays? We all know birthdays are like… well, they’re like opinions… everybody has one. So who are the greats born on your day? Maybe it’s you.